Cabin decor is tastefully traditional – the style of a luxurious classic yacht, where everything is ingeniously designed for comfort, ease and efficiency. Polished brass fittings and mahogany brightwork complement soft natural fabrics in the colours of the sun, sea and sky. 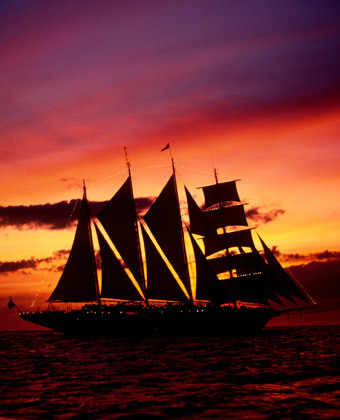 Prints of famous clipper ships and sailing yachts grace the walls. Everything is immaculately maintained and your steward knows exactly when to appear. Cabins have a double bed or twin beds that can be converted to queen, marble bathroom, private safe, television with in-cabin video, DVD player, direct-dial telephone, hairdryer and comfortable furnishings. On Star Clipper and Star Flyer the Owner’s Cabin has a sitting area, plus minibar and whirlpool bath. Category 1 cabins have minibar and whirlpool bath. Category 2 to 5 cabins feature marble bathroom with shower. Category 6 cabins are inside with upper and lower berths, bathroom and shower. 14 deluxe suites on Royal Clipper offer superb cruising comfort, with private balcony, sitting area, whirlpool tub and 24-hour room service. The 90 outside cabins are similar to those on Star Clipper/Flyer, with all but six cabins outside. Your Star Clippers cabin or suite is perfect for rest and relaxation.